LIKE any other hospital, Jai Prakash Narayan Apex Trauma Centre at the All India Institute of Medical Sciences (AIIMS) needs a steady power supply, air-conditioning and running hot water. The way it meets these energy needs is, however, different from most other buildings in Delhi. Instead of the usual grid-based electricity, the centre has installed a tri-generation system, the latest buzzword in energy efficiency technology in India. As the name suggests, the system can produce three energy types—electricity, heating and cooling—simultaneously from a single fuel. 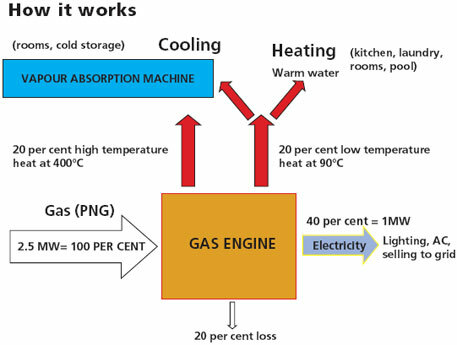 The captive tri-generation system in the centre uses Piped Natural Gas (PNG) to produce electricity through a gas engine and utilises the waste heat produced in the form of exhaust gases during this process for heating and air-conditioning. In conventional power plants, the exhaust gases having high green house potential escape into the atmosphere. A tri-generation system utilises up to 80 per cent of the fuel energy as opposed to conventional power plants where only 25 percent of the fuel energy reaches the end user. The tri-generation plant inside the trauma centre is government’s demonstration project to evaluate the feasibility of the technology in the country. Started in 2008, the pilot project was jointly implemented by the Bureau of Energy Efficiency (BEE), a statutory body under the Ministry of Power, and GIZ, a German development agency. The project was funded by the federal government of Germany. Performance results of the four-year project are awaited. “By producing power locally we can avoid transmission and distribution losses that are the main cause of the demand and supply gap,” says project coordinator Anant Shukla of BEE. He explains how the technology works. The natural gas is fed into an engine that converts 40 per cent of it into electricity. During the process, exhaust gases are released at a temperature of up to 400 °C. These are fed into a Vapour Absorption Machine (VAM), having a vacuum coil filled with water and lithium bromide, for cooling. The high temperature gases make the water heat up and vapourise. These vapours cling to the hydrophilic lithium bromide and lose their heat. Consistent absorption dilutes the concentrated lithium bromide, making it lose its affinity to absorb more vapours. The high temperature heat being continuously fed in VAM heats the lithium bromide which then releases the cool vapours and starts getting concentrated again. These vapours are collected in a separate chamber for cooling. Once cooled to 7°C, they act as a liquid refrigerant for air conditioning. For heating, the jacket water that circulates around the gas engine to keep it cool is used. The water absorbs the heat from the engine and reaches a temperature of up to 50°C. This hot water is directly used in the hospital’s laundry and kitchen. Essentially, heating and cooling happen for free. 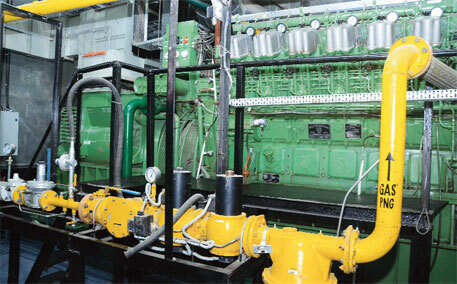 Indraprastha Gas Limited, New Delhi, is supplying the PNG for the system. Earlier, the trauma centre was solely dependent on grid electricity to meet its power need of 1.5 MW. Now, 40 per cent of this need is fulfilled by the tri-generation plant. The total average energy requirement for cooling is 220 tonne of refrigeration (TR) inside the trauma centre; of this around 105 TR is now met by the new system. “We did not replace the entire power demand at the centre with tri-generation because we wanted to demonstrate the technology first,” says Shukla. The current capacity of the gas engine is 350 KW. For complete replacement a gas engine of 1 MW would be suitable and remaining 500 KW could be met through exhaust gases. “The trauma centre is expected to save Rs 2 crore on power and around 40,000 tonnes of CO2 annually,” he adds. The technology is best suited for sectors like hotels, hospitals, airports and shopping malls where there is simultaneous and continuous demand for power, cooling and heating, says S C Kaushik, professor at IIT, Delhi. According to the GIZ data, the potential of this technology in India is estimated to be over 13.5 million KW. BEE officials say the very purpose behind the demonstration project is to correctly analyse the economic and technical feasibility of the technology for convincing the target group. Tri-generation is an advancement over the co-generation or Combined Heat and Power (CHP) technology, being used by some Indian industries to save power. But the limitation in co-generation is that the waste heat can do either heating or cooling besides generation of electricity, and it is 50 per cent efficient. Whereas, in case of tri-generation or Combined Cooling Heating and Power (CCHP) technology the efficiency is up to 80 per cent and three kinds of energies are generated simultaneously. Besides the trauma centre, which is the first public building to use tri-generation technology, only a few private players, like The Leela Palace in New Delhi and DLF mall in Gurgaon, have adopted the system. “This is because of the increasing gas costs,” says Bhaskar Masineni, chief engineer at The Leela Palace. As a result the 1.9 MW tri-generation plant installed in the hotel is lying unused. “We installed the plant in 2010 to replace our total power requirement of about 2.1 MW. At that time the gas price was Rs 20/kg. Now it is Rs 40 per kg, making the operation uneconomical,” says Masineni. Shukla cites unavailability of PNG as another reason. There is only one supplier of it in Delhi, and the gas production at Reliance’s KG D6 basin in Andhra Pradesh is down. He says other fuels like biogas or diesel can run the tri-generation engine but again diesel causes pollution and is getting costlier and biogas generation is yet to begin at a commercial scale in the country. According to industry sources, tri-generation systems installed in the country have a capacity of around 500 MW, but how many of these systems are operational is not clear. “High investment cost is another problem,” says Shukla. Per MW cost in tri-generation is around Rs 6 crore, whereas in case of diesel it is Rs 3 crore. “The technology is worth an investment only if policy atmosphere is supportive,” says Masineni. The maximum payback period should be five years, he adds. 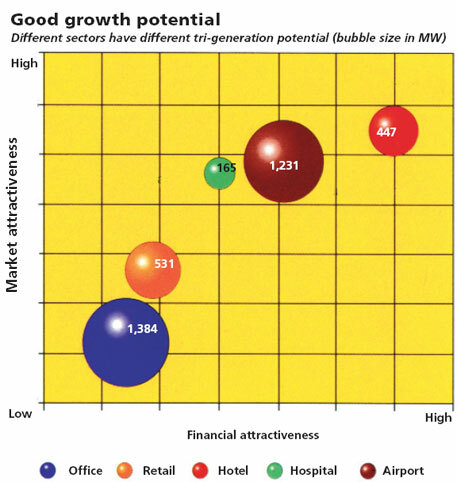 Though the technology is in a nascent stage in India, tri-generation is popular in many countries, including Germany, China, Switzerland and Australia. Sydney plans to fulfil 70 per cent of its energy demand using a network of tri-generation systems, under the Sustainable Sydney 2030 mission. The rest 30 per cent would come from renewable energy sources, making Sydney free of coal-fired power plants. It is one of the many initiatives the city is taking to achieve its ambitious target of reducing greenhouse gas emissions by 70 per cent below 2006 levels by 2030.